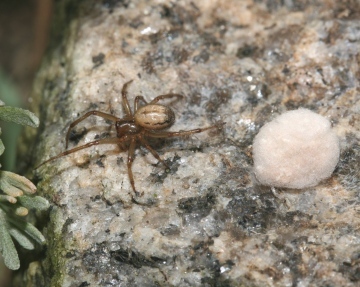 E. mordax is confined to coastal sites in the south and east of England and South Wales, with a single old record from Dumfries-shire. The main centre of distribution is between Suffolk and north Kent. The species is widespread but uncommon in western and central Europe as far north as Sweden, where it is included on their Red List (Gärdenfors 2000). E. mordax has been recorded from saltmarshes where it is found amongst litter on the strand line and on vegetation at the upper end of the marsh. Adults are found in early summer with a peak of both sexes in June, females occasionally persisting until September. Recorded from 18 hectads post 1992, with little apparent change. Drainage and reclamation of saltmarshes may pose a threat. Sea levels around Essex are rising relative to the land by some 6mm a year, a combination of the land sinking and sea level rising as a result of global warming. This is causing erosion of saltmarshes and at the present rate most of the habitat will have been lost within a few decades. Many of the Thames Marshes have been reclaimed for industrial development, with the extensive use of vertical concrete-capped iron pilings along the waterfront leaving very little saltmarsh. With the abandonment of older industrial sites next to the Thames, there is now enormous pressure from initiatives such as the 'Thames Gateway' to redevelop, often for high value riverside housing. It seems unlikely that the importance of small areas of fragile saltmarsh will be adequately taken into account. Managed realignment, where traditional hard sea defences are replaced by softer, more responsive and natural defensive beaches, or where the sea is allowed to reform saltmarshes inland of the existing defensive wall, may provide new habitat suitable for this species.